Mexican street food brand Wahaca is staging a three-day fiesta in celebration of Mexican festival, Day of the Dead. 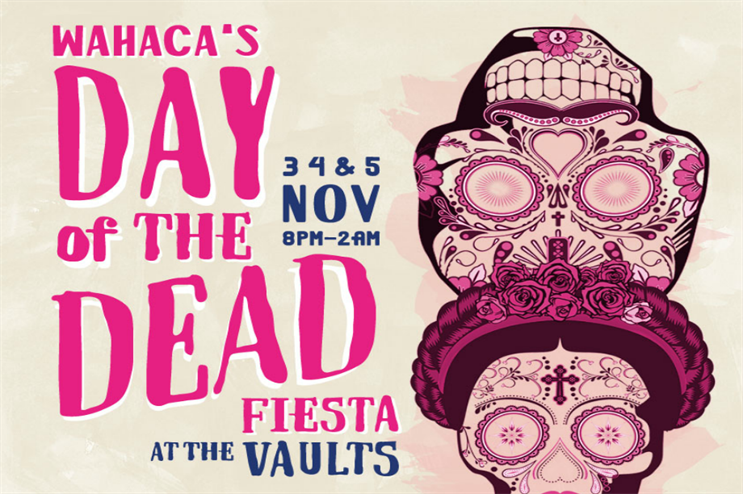 Taking place from 3 to 5 November, the Wahaca event will be held at The Vaults in London’s Waterloo, which will be transformed into a den of Mexican festivities with three nights of live music and live art, hedonistic performances, street food and tequila. Wahaca held a similar event last year, but for only one day. A free-to-enter market outside will offer pre-fiesta delights for guests to explore before they head inside. The Leake Street Tunnel market will kick off the celebrations on 3 September from 6pm. Both fiesta ticket holders as well as members of the public will be able to access the market, where they will be treated to street food from the likes of Patty & Bun, Bob’s Lobster and Annie Mae’s Mac & Cheese serving their signature dishes with a Mexican twist, as well as Mexican favourites from Wahaca and DF/Mexico. Smaller street food traders will offer traditional treats of pan de muerto and hot chocolate. The market will be open until 10pm each day, encouraging visitors to get into the fiesta vibe with a face-painting station offering traditional Calavera skull design and a dressing up area as well as wrestling and Mexican music. From 8pm each evening, the immersive Dia de Muertos procession of performers and dancers will lead guests from the market through to The Vaults. Live music from electro-Mexican DJ’s will set the scene for a 'Grave Rave' in one corner, while around another turn, guests will be confronted with masked Mexican wrestlers performing on a live Lucha Libre stage. Paying homage to the festival’s heritage, the Tunnel of Remembrance will celebrate the lives of icons like David Bowie, Alan Rickman, Prince, and others who have passed away this year. Life-drawing, poetry and artwork will submerge guests into the culture of the country and its favourite festival as Latin-punk, Afro-Mexican and indie mambo bands perform until the early morning. Confirmed acts include Centravrvs, The Indios, Orkesta Mendoza, and Family Atlantica. Heading into the night, DJs from The UK and Mexico will keep the party alive. Mezcaleria and tequila bars across The Vaults will offer drinks while the Wahaca and DF/Mexico stalls will serve up tacos, tortillas and other Mexican street food staples. For the ultimate foodie experience, Wahaca restaurant co-founder Thomasina Miers and Mexican chef Santiago Lastra Rodriguez will host a set course dinner on each of the evenings from 6.30pm, with tickets including entry to the fiesta afterwards. The meal will combine the best of Mexican and Latin American cuisine. Wahaca brought its spoon amnesty experience back for yet another year in January, in a bid to retrieve some of its brightly-coloured spoons, with more than 5,000 disappearing from its restaurants each year.